where neighboring Japan’s early Shinkansen started in 1964 and evolved into several beautiful designs over the decades, and France’s gaie TGV in 1981 . 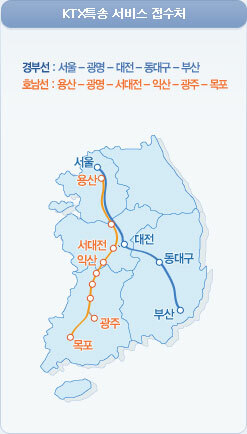 South Korea’s bullet train started long~ after its development into a major IT information technology power, on April Fools Day 2004 .
is outdated (yawn, yeah this an advanced IT nation) showing Northern Seoul-DaeJeon as a single route, which has since been separated into Western and Eastern Routes heading South to MokPo and Busan each respectfully . Delivery Service map near the bottom of this page, illustrates overlapping routes as separate West and then East lines for better understanding . at the on-set, all KTX routes started in the Capital at Seoul Train Station and then stopped at YongSan next down to the South . but now only South-Eastern-bound trains towards Busan or Pusan start at Seoul Station, while those South-West-bound to DaeJeon and MokPo start at YongSan Station . although both are now rebuilt from the ashes of the Korean War and now interlocked as large shopping complexes, Seoul Station only encompass a department store and a supermart, while YongSan is a many times larger shopping complex inter-twining several shopping malls . riding the train you will feel a portion of the route more rattling AND noisy than others . this is because NOT all rail routes along KTX lines are adept for bullet train . they run faster only on newly-built designated portions . to find your way through, it is important to note that the carriage numbers always start with the direction the train is heading . that is : (half of) front carriage 1 is dedicated as a movie theatre and 2 through 5 are SPECIAL CLASS . when purchasing at ticketing counter : seats are given from center carriage and spread front/back, so ask for furthest carriages when buying standing (sitting only when seats are available). each row in a KTX row has 4 seats, where SPECIAL CLASS has 3 with ONE being a single independent seat NOT connected side-by-side to another . the seats IN each carriage in SPECIAL CLASS, start North to South . meaning : the front seat on a Busan or Pusan to Seoul bound train is seat 1, while the most front seat for South-bound trains would be 12 .
and 10% if purchasing 15 ~29 days ahead for weekdays and 5% discount for weekends and holidays . also, for fore-most front AND rear seats get a slight discount also . good discounts are available for the casual traveler, as well as ticketing through automated teller machines with credit card payment at boarding stations . with membership which is FREE, you get access to a generous (space-wise as well as available facilities) Members’ Lounge at larger stations, complete with computers with FREE internet access, magazines and drinks . as a nation with the FASTEST domestic internet connection, all KTX trains have wireless internet connection accessible with a pre-paid card, supplied free in First Class or Korean translated “Special Class” by asking the conductor . but it is a joke, hardly offering a stable connection . but again, this is meaningless for serious surfers would subscribe to several mobile alternatives such as WiBro Wi-Fi introduced in my BLog . for all the technological advance Millennium South Korea is enjoying, especially the FASTEST domestic internet connection on Earth, as well as extensive modes of wireless connection throughout concentrated metropolis .. Einstein haunts constant speed . aside from slow speed as well as unstable connection, limit cap on internet access (FREE on SPECIAL CLASS) was a joke barely enough for you to check eMails, but they really have worked on this by BLACK FRIDAY (although the shopping is non-existent in Asia) : every TWO carriages get on Wi-Fi node, and speed is now acceptable though NOT FAST, and a much reasonable connection allowance where they note (on initial access): an hour surfing on the .Net or downloading files for 10 minutes . originally set out to be a door-to-door express delivery system within South Korea in a single day, has now shrunken to a mere selective station-to-station delivery option . where if it can become full door-to-door if you add the so-called Quick Service courier yourself . and insurance up to W500,000 merchandise . and 100% if delayed more than an hour . Hi there, here is more KTX tip for you. As you know, KTX is high-speed train in Korea connected to out of city places like Busan, Dongdaegu, Singyeongju, Jeonju. from Seoul. You can buy KTX ticket from any station counter of you can make a reservation from Korail homepage. Also there is ‘Korail pass’ and this is KTX pass you can take all KTX lines when you need. There are normal, saver(between 2 and 5 people), youth(ages 13 and 25). And there are 1day, 3days, 5days and 7days pass so you can choose what you need. If you want to get more information about this, please visit this homepage ‘http://www.letskorail.com/ebizbf/EbizBfKrPassAbout.do’ Thank you. hi, i just bought a first class ktx ticket for 2 person. Do i still need to buy the korail pass? i’m just travelling one way from busan to seoul.